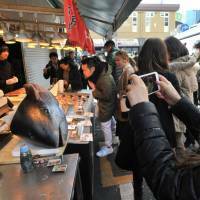 With Tokyo’s iconic Tsukiji wholesale food market gearing up for an October relocation, many people believe the adjacent shopping area, known as the Tsukiji outer market, will also depart. To inform visitors that the outer market will stay and to ensure patrons continue to visit, shop owners there are running a “we’re not moving” campaign. 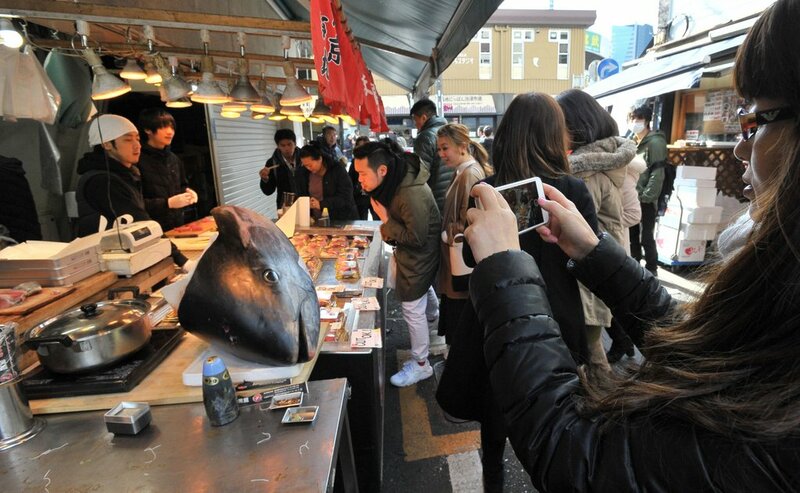 Some 500 shops, from sushi restaurants to specialty shops selling marine products and cooking utensils, line the outer market and are a popular destination for professional cooks, as well as Japanese and foreign tourists. Shop owners say they have been asked many times by tourists whether the shops in the outer market are moving to Toyosu, even though it is only the wholesale market — known as the inner market — that is relocating to the new location about 2 kilometers from Tsukiji. “Even tourist guides had it wrong,” said a worker at the outer market. The outer market is also spreading the message via posters and its website. Recently, an event was held to canvas public opinion about a possible name change for the outer market. The organizers will reach a conclusion late this month after examining suggestions from local residents and visitors. “Even after the relocation of the inner market, we want to preserve the hustle and bustle as a food town with a long history,” said Akio Suzuki, head of a nonprofit organization representing those involved with the outer market.